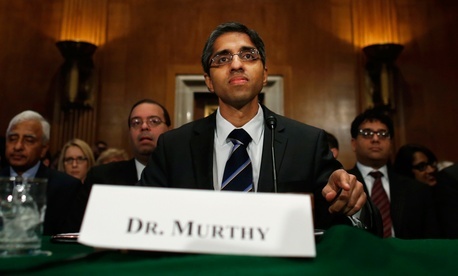 Vivek Murthy is the new Surgeon General of the United States, after a hard-won confirmation by the Senate yesterday. Murthy, whose position that guns are a health-care issue in the US earned him the ire of the country’s powerful gun lobby, will serve a four-year term as the nation’s top doctor and public health advocate. The position has lacked a permanent director since July 2013. Murthy co-founded Doctors for America , a group of 16,000 physicians and medical students that sent a strongly-worded letter (pdf) last year to the Congress, urging politicians to take stricter measures to stop gun violence. That earned him the ire of the National Rifle Association, slowing his confirmation, but may have also been one of the factors that ultimately helped him win the support of dozens of politicians, medical groups, and universities. The circumstances and causes of gun-related injuries and death are diverse–mass shootings, suicides, individual disputes, robberies, and accidents. There is no single provision that will stop these tragedies from happening, so we must approach the issue from all available angles, just as we have successfully approached other threats to public health such as motor vehicle accident deaths and deaths from fire and drowning. During his February 2014 opening remarks (pdf) in front of a Senate nominating committee, Murthy stressed the US’s other health problems, saying if he was nominated he hoped to “marshal partnerships across the country to address the epidemics of obesity and tobacco-related disease, to reduce the crippling stigma of mental illness, to roll back the resurgence of vaccine preventable disease” and to address many other issues. During that nearly two-hour hearing, senators questioned him about his track record on public-health management, what he thinks of medical marijuana (he’s heard of “anecdotal evidence” but believes “more information” is needed to safely prescribe it), and, predictably, guns. My concerns with regards to issues like gun violence have to do with my experience as a physician, seeing patients in emergency rooms who have come in with acute injuries; but also seeing many patients over the years who are dealing with spinal cord injuries, post traumatic stress disorder, and other chronic complications from gun violence. We can no longer remain within our exam rooms and ignore what happens in our communities. As physicians and dentists, we must have a presence in both places. Our sacred responsibility is both to help the patient in front of us and also to safeguard the health of the nation.